New In The Market met shortly with one of the Business Center officers taking care of new accounts for Meralco and asked what this Billing Deposit is all about. I’ll just refer to the person we talked to as Mr. N. Cortez. Billing Deposit is, Mr. Cortez explained, is the amount a customer incurs because the electrical load amount exceeded the original electrical plan given to them to begin with. It is not a penalty or any residual amount that we failed to pay with Meralco or any of what news wires are filing recently. For example: The electrical plan of a house/ business submitted to them when you first applied with Meralco requires a 10,000 watt capacity BUT what your Architect or Contractor submitted was 1,000 watt capacity electrical plan only. Over time, Meralco sees what electricity you really consume and that’s when Meralco compensates the difference. This difference in the amount of capacity your residence/building really needs leads to a Billing Deposit. 2. Because the customer doesn’t want to pay more upfront and therefore under-reports the real or planned consumption is. Either way, Mr. Cortez further stressed that it is better to over-estimate your load requirements than to under-report or under-estimate it. Can the Error be corrected? Mr. Cortez says that Meralco will now be applying corrective measures so that their customers won’t be needing any surprises in the future regarding this Billing Deposit. So for now, he insists, that a customer can ask for a payment plan – if the amount is too high – by visiting their nearest Meralco Business Center. 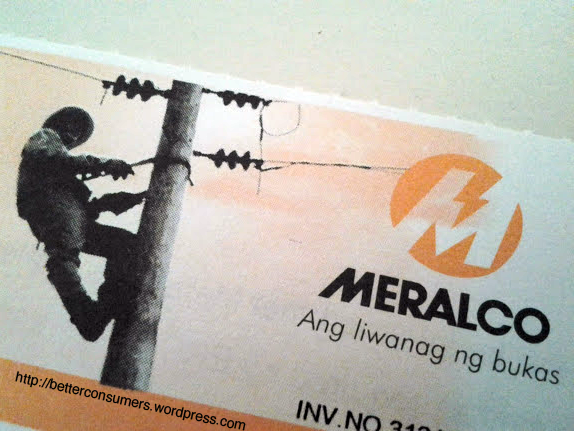 Paying Billing Deposit is a first for any one and he says this is the first time Meralco is asking customers to pay for what the electric company is compensating in the electrical load amount you are receiving. Billing ‘Deposit’ according to Mr. Cortez is not a penalty for paying your bills late. It is the translated amount (in pesos) for the load of electricity your residence required compared to the initial load requirement you submitted to Meralco. It is a good lesson to learn from and if you’re a business owner requiring help, please go to your nearest Meralco business center at 8 AM and ask to be directed to the Customer Welfare Office to speak to their representatives regarding payment plans to your Billing Deposit. By the way, if you’re a Condo Owner and you don’t pay your utilities directly to Meralco, you should read this and know how you can do something about it. How about us, whose just renting a place? The meter is not even under our name. If we pay for the bill deposit and we decided to leave the apartment, how can get our money back? The owner of the apartment told us that he is not going to pay for it. Please enlighten us. Thank you very much! The refund is not automatic. Meralco promised that they will give a refund IF owner has been paying his bill without a single day late for the next three years. That’s quite a tall order. So if your question is that of if your landlord pays his Meralco bill in the next thirty-six months without being delayed then yes you should make an arrangement with him or her. I just hope your landlord/lady could be more forgiving than the attitude he/she is showing you right now. 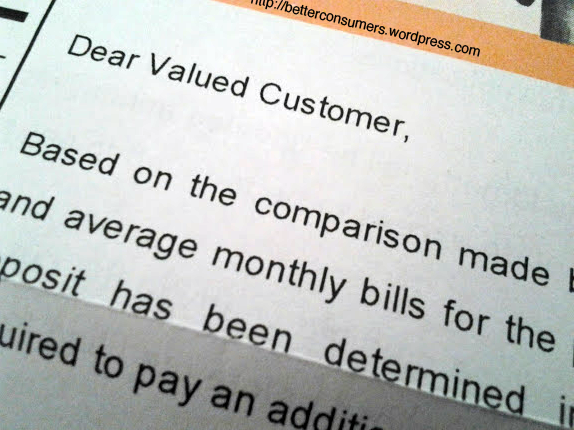 I suggested some answers in my blog after this one: https://betterconsumers.wordpress.com/2012/10/11/meralcos-billing-deposit-potential-headache-for-condo-owners/ but since you have a more intimate setup with your landowner then just hope that you get something back in the next three years BUT if he or she is a good payer – paying his Meralco bills without delay. I hope this answers your question. Feel free to expound.